Thomas Kinkade, the ‘Painter of Light’, who died last week at the age of 54, worked one of his first jobs for the Lord of the Rings director Ralph Bakshi. 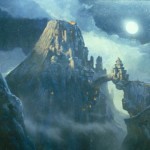 In 1983, five years after making his version of Tolkien’s story, Bakshi directed a movie called Fire and Ice, and Thomas Kinkade, then 25, painted backgrounds for the film. Bakshi talks about the painter here.